What the heck is doof? Dooflets. Doofspace. DoofPulse. Doof. What is doof? According to Wikipedia doof is a type of outdoor dance party in Australia. The Urban Dictionary defines doof as a foolish person. While I may be a fool, I am not in Australia and the doof I am referring to is actually a fun little social startpage built around casual gaming. Doof, a London-based startup, offers a social startpage experience built with Flash. It incorporates many of the same features that Facebook and other social sites offer but emphasizes fun and games as its main focus. 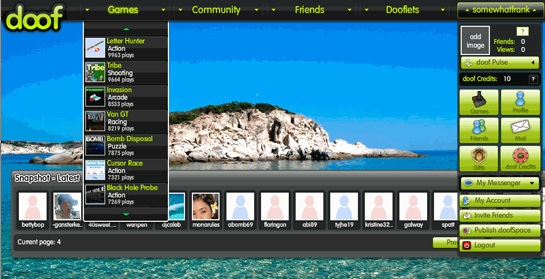 With doof users meet and compete in social games. Games range from arcade to simpler word and strategy games. Scores are posted and winners are rewarded with credits which are the currency of doof. Doof's interface is very slick and reminds me of another startpage, yourminis. I like the way doof integrates social features but keeps its focus on fun and games and I am not doofing ya.